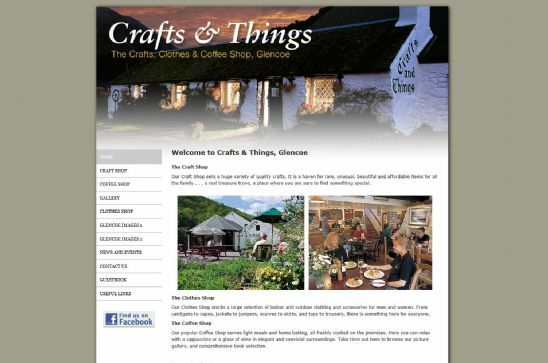 You'll find Crafts and Things in Glencoe, Scotland. Not just a craft shop, they are also a clothes shop and a coffee shop. Browse their rare and unusual craft items, and stop for a bite to eat or a cappuccino. The website also has a gallery of Glencoe images, which are available for sale as well as news and events for the local area. The website has been created using the Spanglefish website system, which uses easy to use design templates. We can link domain registrations with Spanglefish sites and provide email services as part of our Spanglefish bundle.